Over the last few days, I’ve not been feeling too great. My wisdom teeth have caused me so much pain – any recipe development has been completely off the cards!! Luckily, I visited my dentist a few days ago, and he managed to bring some relief to the pain (I won’t go into gory detail). But, since then I’ve still felt a bit under the weather, so I knew it was best to rest for a while, then start up again when feeling better. 3 days away from writing and cooking gave me the rest I really needed, and it gave me a good chance to unwind and reflect on the current situations happening in my life. This website has been such an amazing adventure allowing me to pursue, develop and push my creativity. Already, I’ve experienced so many things and had some incredible opportunities come my way. I am so grateful for all of the things happening in my life now, and I can honestly tell you that none of this would have been possible if I hadn’t taken this risk, followed my intuition and chased my true desires. There are so many things we all want to achieve in our lives, and there is no reason why we can’t succeed at them. Often, the only reason we don’t do something is due to ourselves and our mindsets. It’s very easy to remain in our comfort zones, as it’s what we know best. However, as soon as we leave it behind, and we take that risk – whatever it is, we begin to feel the true beauty of life. By taking risks, we are living the unexpected and chasing our dreams, allowing the mystery of life to thrive within us. That uncertain feeling that creates an energy within, and pushes us towards our goals allows us to achieve things and manifest success in unimaginable ways. This is what unexpected means, the beauty of living for your desires. We all have these goals within us, and we know how incredible it feels when we achieve them. Of course, sometimes we face struggles, we doubt ourselves and we fear for the future. They are all emotions and scenarios that we face, but they always make our resulting success feel that much better. I know that I wouldn’t have risked everything and chased my true desires, if it wasn’t for the support around me, and the people, the scenarios, the places and the objectives that push and inspire me. In life, I’ve always found hope and inspiration in stories. The tales of other peoples journeys, other peoples experiences and finding a connection between them and myself. Finding things and similarities between my life and someone else’s, always gives me that drive to keep on pushing. I’m inspired by so many people, and there are so many stories and tales that helped me to get where I am now. There are so many inspirations I could write about, however there have always been three key figures in my life that have been my main driving force in what I do. So, today I chose to write about them and how they inspire me. About 6 months ago, I picked up ‘Steve Jobs: The Man Who Thought Different’ by Karen Blumenthal. I can honestly say that this was the first book that changed my life, completely. After reading this book, my whole thought process had changed, I believed in myself more, reading his story enabled me to realise that yes, anything is possible. Everything in this world begins with ‘I’. We have the power to manifest any life into our reality, and when we know and believe in this, everything we set out for begins to happen. I’ve discovered in many books now, that the people who achieve their goals successfully ‘just know’ the outcome that they want. They ‘know’ it is possible. I believe we all have this knowledge and instinct within us, but many of us are yet to find faith within it, and are scared to follow it. This book really helped me to pay attention to my inner ‘compass’, and allowed me to find faith in following it’s direction, allowing the journey to unfold in front of me as I travel forward. 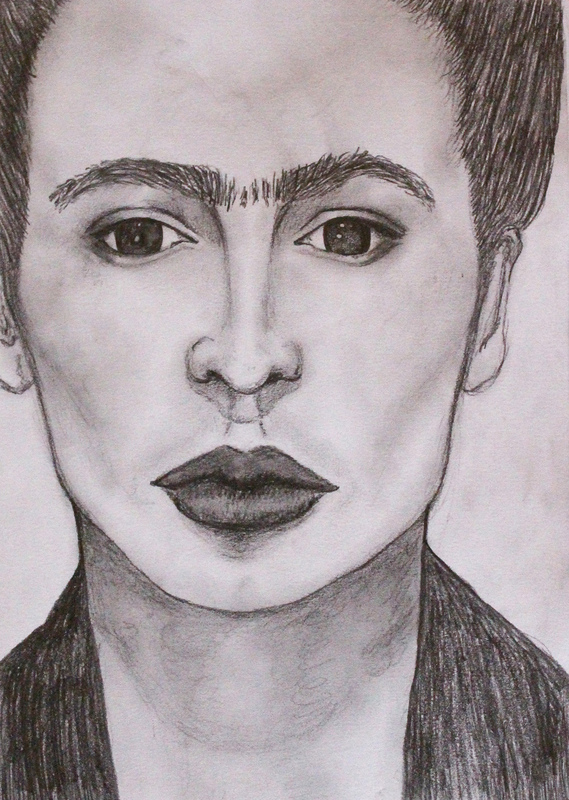 Frida Kahlo is someone who inspired my artwork long before I knew of her existence. When I was younger I wasn’t actually aware of her work, until my art teacher at the time told me that I had created a piece just like something of hers. I had sketched a portrait of myself with birds in my hair, representing our human connection to nature. Instantly, I searched for her work and was in awe of the complete beauty and genuine, heartfelt emotion behind her art. Since then, I’ve been utterly inspired and connected to her artwork and her story. It is the passion within her life, and her sheer, honest love and dedication to her work, that deeply resonates within me. Her ability to stay true to herself and her work, and indulge so much of herself into her art is something I admire incredibly, and motivates me every day. Her honesty and her wisdom to speak how she felt was something so beautiful, and still brings joy and reassurance to so many of us today. This is the man responsible for the driving force behind everything I do, and work towards on a daily basis. Richard’s life is an incredible story, and is the truest reflection of all the possibilities we can achieve. In life, I’ve found that many times it is easy for us to focus on just one thing we are good at, and solely pursue it until our time is up. Many of us feel encouraged to do this. However, I knew that in my life, this simply wouldn’t be possible. For some people, there is one pure desire that makes them content. But, in my life, there is a vast, varying amount of desires that I set out to achieve. There are so many things that I aim to accomplish, and so many times I’ve been told no. Being told ‘well you can’t do everything’ are the words that set my soul alight. If it wasn’t for the success of Richard, I wouldn’t have the courage and as much of the belief I have within me, to know that everything and as many things as possible are completely achievable. With businesses ranging from beauty to aeroplanes, he inspired me to know that I can achieve a life as vast and diverse as my dreams. As such an honourable man, with the purest courage and determination I’ve ever known, he has to be the person I look up to most in todays world. There are so many things to be inspired by in this life, we live in such a beautiful world, where we have the ability to make even the wildest of our dreams possible. I hope that today you find that inspiration, and take that step closer towards what it is that makes you happy. Joy is the core element to your success, so whatever makes your heart content, do it. I hope you enjoyed my sketches too! Who inspires you, and what is it that motivates you to achieve your desires? This is a wonderful post Harriet. Thank you for being so honest. I too respect and love Richard Branson’s story, he’s a true inspiration. I hope you’re feeling better. Wisdom teeth are horrible. Thank you so much Linda, I’m really glad you enjoyed the post :). I’m beginning to feel better now thank you, they’re a nightmare aren’t they!! Thanks for sharing, I truly enjoyed reading this write-up, and the portraits as well of course! Thank you for your kind words Melody! I hope you are feeling better today. Wisdom teeth are horrible and very painful. . Take good care dear. Get well soon. .
Coming to this post, superb sketches and loved reading you. you express so beautifully , very thoughtful and motivational post. That’s the way to go..
Wow, beautifully written my dear friend! “By taking risks, we are living the unexpected and chasing our dreams, allowing the mystery of life to thrive within us.” <– That is golden! Thank you so much Rebecca! So glad you like those words! Wow! These sketchings are gorgeous! I absolutely loved reading this post, hearing where you get your inspiration and how you overcome fear. It’s so inspiring and a great reminder to believe in ourself. And your artwork – incredible! I hope you are feeling better. Keep up the amazing creativity! Obviously it comes naturally to you! Thank you so much Kristi!! I’m really glad you like them. Thank you so much for your kind words and for enjoying the post, I’m so pleased that it inspired you!!! It means a lot to me! Thank you Anu!! I definitely agree 🙂 I’m glad you enjoyed the post! Great artwork! Hey, if you can’t cook or eat right now, you can draw! Feel better. Thank you Mir! Yes, definitely!! Thank you so much Manali! I’m so glad you liked the post 🙂 I know they’re so painful! Ouch, that doesn’t sound nice!! What lovely sketches, Harriet! It was so fun to read how each of those people inspired you. 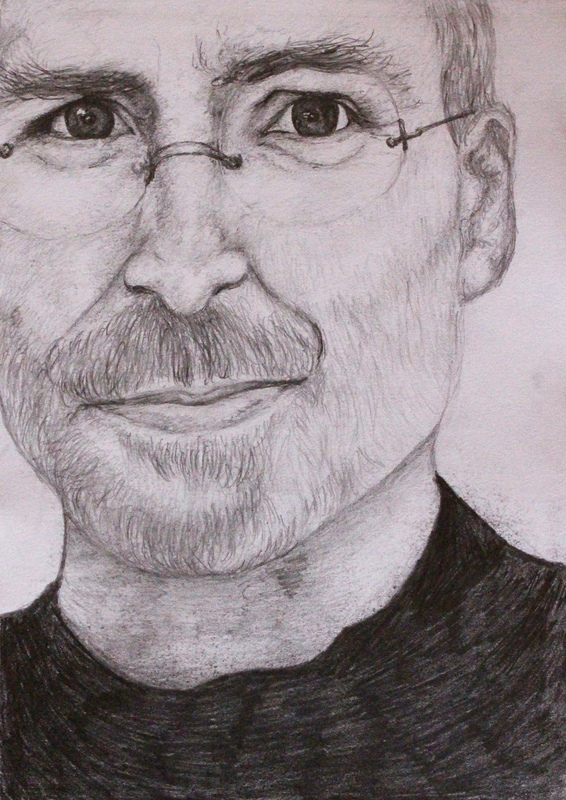 Steve Jobs has always been inspirational to me; he was also so persistent and daring. And it was so cute to imagine younger Harriet sketching a portrait of herself with birds in her hair! A mini Frida! 🙂 But you’re so right; if you stay perseverant and take risks in life to follow your passion, you will be rewarded in ways you can’t even imagine! Thank you so much Beeta! Same here, it’s so inspiring when you hear what risks people have taken, and all of the courage they have. It always motivates me! Hehehe thanks! I completely agree with you, the rewards can be so amazing! What a lovely, inspiring post, Harriet! These portraits are remarkable, I wish I had half the talent! Also, I’m also so sorry to hear about your wisdom tooth problems, I know that is not fun at all. Thank you so much Sam! That means so much to me, you are so kind! Thank you – yes, they can be so unpleasant!! Thanks for sharing this and your drawings here Harriet! You are so incredibly talented, lady! !